Are you trying to grow a cannabis plant outside and want to know more about the process? You came to the right place! We'll be giving you a detailed introductory guide on cultivating your own cannabis and achieving the best yields of outdoor bud possible! Growing cannabis indoors has become more and more popular as technology improves. But that’s the catch; indoor growing requires a lot of equipment. And all this equipment will still require your constant attention. Unless you spend thousands on an automated system, having an artificial light and water source will demand your intervention. Outdoors, on the other hand, you can’t control the sun nor the rain, yet both will still exist whether you intervene or not. Besides the obvious materials needed for an outdoor plantation, what you’re absolutely required to have is passion. If you have that, then there will be nothing you can’t achieve nor a mistake you can’t solve. 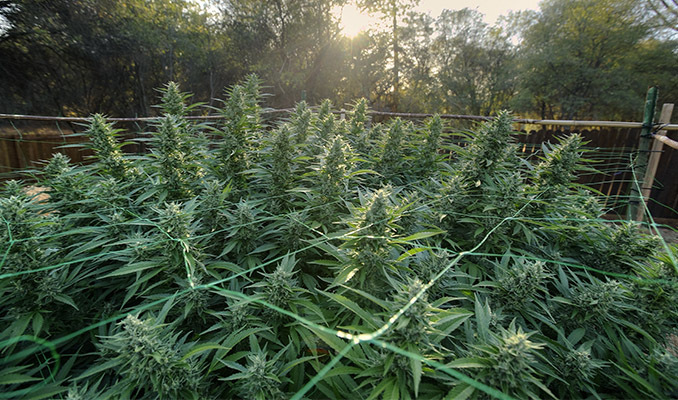 When growing outdoors, you’ll have to look beyond what your intended high is. There are multiple factors you should also be considering. Certain seeds will grow better in some environments than others. Having the proper strain can make all the difference between a great yield or no yield at all. If you live in tropical areas, you’ll be lucky to discover that almost all strains will grow well outdoors. These are extremely humid places with little to no change in climate through the seasons. You’ll have a nice long growing period where your plant will rarely be under stress. The main issue is mould (more on that later). It really won’t matter if you’re growing an indica or a sativa. Both will have enough time to grow. If you live in the Mediterranean or the United States, you’ll have to be pickier. In these climates, you’re better off with an indica or indica-dominant hybrid. For the northern European growers, try an indica-dominant strain that will finish flowering stage around September/October. Critical XXL is a great option for this. Once you have your perfect strain selected, it’s time to decide where you’re going to grow it. Unless you have a huge pot with wheels, it might be hard to move the plant around once it’s growing. Choosing the right spot will help ensure your plant gets the sunlight it needs and isn’t damaged by excessive wind. All you have to look for is a place where your cannabis plant can get a lot of direct sunlight. 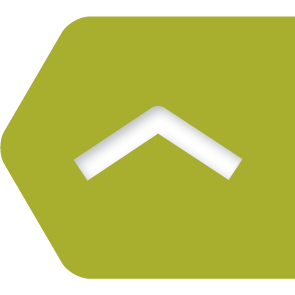 A balcony or garden facing south will guarantee this as long as there are no obstructions. The perfect scenario will be if you can get 6 hours of direct light during the hottest hours of the day. These will start at around 10am. If you live in an extremely cold place, placing your plant next to a wall or something that retains heat will help your plant avoid stress. This will be different if you live closer to the equator. With average temperatures around 30°C, you should try to filter sunlight during the most aggressive hours and find a spot with a cool breeze or nearby shade. Also, remember to avoid surfaces that retain heat during the day such as asphalt pavements and brick or stone walls. If you want to make sure your seeds grow into plants, germinating them indoors before transferring them to the pot can be a great idea. This will also be a smart thing to do if you want to plant several seeds and only use the healthiest ones. You’ll be sure you’re not wasting soil and fertiliser on a seed that isn’t going to give you a proper plant. The best time to start germinating seeds is during the spring. Find a sunny window board. Do not take them outside until after the first three, maybe four weeks. This is when seedlings will be approximately 15cm tall and have at least 3 branch nodes. Seedlings should be resilient and healthy before placing them at risk of insect bites, wind, and aggressive temperatures. We have a great option on our website if you want to avoid these issues. The Micro Propagator Plus is a complete package for seed and clone germination. 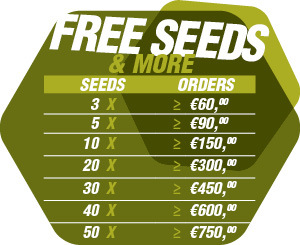 For just over €17, you’ll be getting a controlled environment for 15 seeds or clones, where all you have to do is add water. The kit comes with a full bag of perlite, a thermometer, and a LED grow light. Germination success rate has never been higher. For cannabis plants to survive, they need soil that is rich in nutrients, well-draining, and slightly acidic. This will be found in the best proportions within a silty soil. Soil rich in silt will hold nutrients and humidity, but will still oxygenate the root zone of your plant extremely well. If you’re unable to find a perfect soil compost, you can make your own mixture. A couple of months prior to germinating your seeds, you need to prepare your plantation area. Dig large holes where you’ll be placing worm castings, manure, and any organic compost you have laying around from your day-to-day. This will create a great foundation for your marijuana plant to grow and thrive. With soil for your plant to grow, now you need to worry about the nutrients you’ll be feeding it. Although the soil, manure, and worm castings will already have an abundance of nutrients, the use of external fertilisers will aid you in obtaining the best yields possible. For these, you’ll be faced with different options. You’ll have to choose whether to use synthetic or organic products. The organic solutions will provide high-quality buds, but they consume more of your time. If you do purchase supplements, try to source those specifically designed for cannabis. There are all sorts of options online. But if you don’t have this option, only use general products designed for edible plants, such as tomatoes. If the products are used on fruit or vegetables, then you’ll probably be safe smoking cannabis grown with it. Be aware that overfeeding cannabis plants will lead to nutrient toxicity and can be lethal. Although supplemental fertilisers can be of benefit, too much of a good thing will destroy any chances of a successful crop. Nutrient deficiencies do occur, but often times, novice growers will mistake nutrient lockout for deficiency. This phenomenon occurs when nutrients are available to the plant, but the roots cannot absorb them. This often happens as a result of a pH outside of the optimal range. When growing in soil, cannabis plants require a pH between 6.0-7.0 to thrive. If above or below this range, it is imperative to bring the levels back if quality bud is desired later on. With hard work and perseverance comes great success. And in our industry, success means loads of big, juicy buds. After anywhere between 9-20 weeks, your plant will be ready for harvest! At this point, the pistils will have darkened, the trichomes are becoming milky, and the buds will have puffed out. The main advantage of growing outdoors will be unlimited space. With this, if you’re lucky, you can grow a huge plant that can give you up to half a kilo of bud or more! The only thing left for you will be to trim, which you can do before or after drying your buds. Different growers will stand by different techniques, although “wet” trimming is very popular amongst home growers. 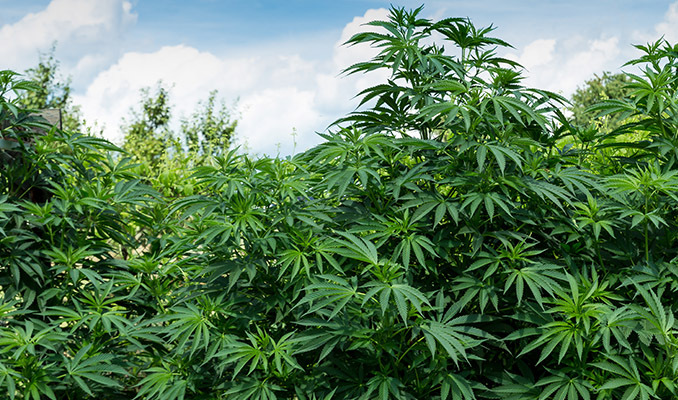 Although it might be awesome to grow your own marijuana plant outdoors, it can become very frustrating to notice problems start to appear if you’re not prepared for them. The outdoors is not owned by us like an indoor facility is. When we grow outdoors, we’re creating a great home for many insects and living creatures. While these little guys might love to have a cannabis plant as their home, they will not treat it like such. Some pests might actually kill your plant, so knowing how to treat these attacks is crucial. If you have a problem with large animals, that will be easy to fix with a fence or a cage. But when it comes to small or microscopic creatures, the best you can do is keep your plant healthy and be observant. Cannabis plants are like human beings in that sense; if they eat well and don't have to deal with constant stress, they’ll have fewer chances of getting sick. Be sure to also keep your marijuana plant away from the other stuff you’re growing. Pests can easily spread from these plants purely for proximity reasons. In the last few weeks, the plant will be very pungent. Buds will emanate intense aromas and almost feel damp to the touch due to high moisture content. And with this comes another problem: mould. Check inside the buds (close to the stem) to ensure nothing is taking over, especially if you live in an ultra-humid climate! Careful defoliation during the vegetative stage is one way to help prevent this, although it’s not always recommended for new growers. The best way to avoid mould during bloom is to ensure your plants have enough space to breathe. Unlike with indoor operations, you can’t simply blow a fan on your plant all day. If you do see mould start to appear and rot your buds, you’ll have to cut off the damaged ones to prevent contamination of the rest of the plant. Do this carefully and you shouldn’t have any more problems. Best of luck with your plants and have a good harvest!